After the jump, listen to John Legend's (C'99, Counterparts) stellar cover of a contemporary hit out now. Our very own "21st Century Girl" rocker, aka Carly Greenberg (C'05) (I like to refer to her as JEM) is singing the theme song for a new show which debuts this weekend. After the jump, check out which show and get a preview of the song! Over the past few weeks, a couple of Liz Banks (C'96) related news items have come out. After the jump, check out the trailer to her new film and find out which coveted book series role she has confirmed taking on! Skater Johny Weir coming to Penn? 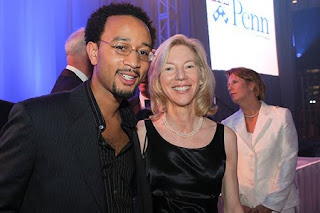 ...And remember THIS tweet from our famous Penn alum about her time at Penn? As we know, Penn alumni really love the red and blue! If you missed it, yesterday, Penn alum Peter Schankowitz (C'83, Mask and Wig) showed us his new split "P" Penn tattoo he just got in New Orleans. After I posted that article, Jennifer Wieczoreck Dwyer (C'93) emailed me and revealed that she also has a tattoo of the Penn shield in the middle of her back! After the jump, check it out and learn why she did it (interesting story here). Several years ago, I did a story about film producer Jody Girgenti (C'98) and how her film (you may have heard of) was hitting the festival rounds. Since then, Jody has produced content for NBC Digital Studios, CourtTV, corporate clients, worked as a commercial producer, and is still focused on film. This Friday, Jody's latest film premieres with music from Duncan Sheik ! After the jump check out a clip from the film, listen to the great soundtrack, and find out Jody and her husband got Duncan Sheik on board! "Something about New Orleans that makes a grown man do irrational and PERMANENT things." This is what Peter Schankowitz (C'83, Mask and Wig) wrote after posting a facebook picture of the Penn tattoo he just got on his arm. After the jump, check out he's now showing off his Penn pride! 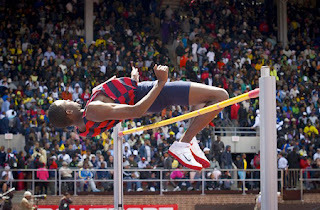 Last weekend, the Penn Relays (now in its 117th year) were in full force. the event attracts more than 22,000 track and field stars from the junior high school, high school, college, senior and professional levels. Athletes from more than 60 countries participated in the three-day event. After the jump, check out some awesome pics and video taken by the Office of University Communications (including behind the scenes coverage of practices, press conferences and warm-ups! 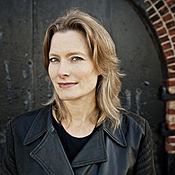 If you haven't heard by now, Penn alum Jennifer Egan (C'85) won a Pulitzer prize for her very creatively constructed novel "A Visit From the Goon Squad ". What you may not have heard is that Hollywood has already knocked on her door regarding the book. After the jump, find out more about the book, and where you'll be able to see an adaptation of this novel in the year/s to come. 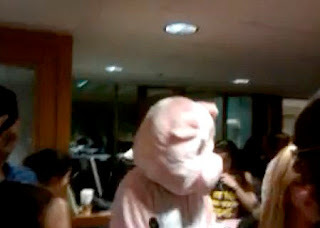 Over the years, Penn students have been pulling off some pretty creative flash mobs around campus from giant pillow fight on Locust Walk, to freshmen freezing on Locust walk for 5 minutes to the (original) silent dance party in the library. Last night, in the middle of finals studying, the flashmobbers struck again with what was supposed to be another silent dance party! After the jump check out the Rosenparty.